St. Christopher is the Patron Saint of Travellers and Athletes. 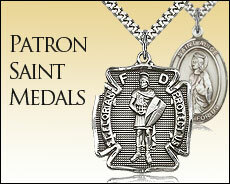 St Christopher Medals are One of the Most Sought After Religious Pendants. Wear one to Show Devotion to St Christopher and it Will Protect you From Harm While Travelling. Browse Our Extensive Collection of Sterling Silver St. Christopher Pendants Below. Our Medals Are Manufactured in the USA and Arrive on a Chain in Velvet Box.